An elderly and deceptively unpretentious Tennessee woman has lived with an unspeakable secret for 50 years. Now that secret is about to be revealed--with potentially catastrophic geopolitical consequences. After 35 years of lost contact, she calls on her former protégé to guard her secret and to destroy her magnificent-and terrible-legacy. 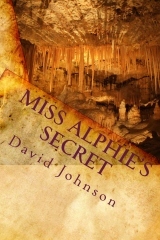 A story of lifelong friendships and confounding relationships, Miss Alphie's Secret balances the idyllic East Tennessee setting and characters that are its surface with the explosive tension building deep beneath Falcon Cottage.